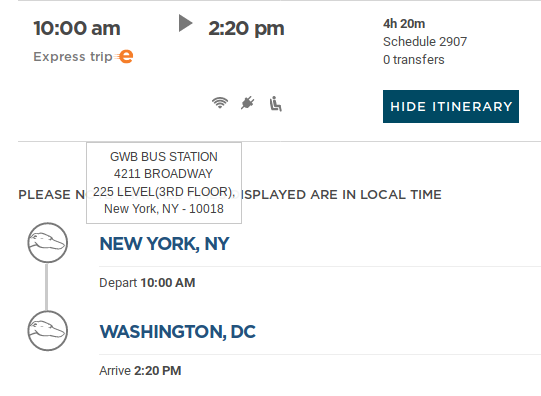 Do Greyhound buses from NYC to DC depart from Port Authority or do they depart from the Greyhound station near the George Washington bridge? This is a bug in the address details on Greyhound.com. Greyhound's main station in New York is still Port Authority Bus Terminal. Searching for New York GW Bridge, NY you'll see different buses than those from New York, NY, prooving the results you're looking at aren't for that station. At Busbud our searches return all stations in the city. You'll see we differentiate between the two stations, and that the vast majority of buses leave Port Authority like you'd expect. We're leveraging the data we're getting directly from Greyhound. 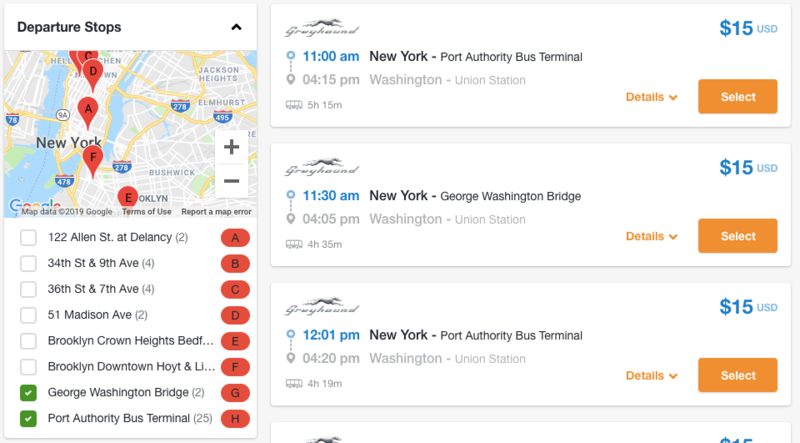 Selecting an itinerary on the Greyhound web site for your desired city pair will allow you to see the location of the bus stations involved. For all the schedules I looked at, it appears that all of them depart from the GW Bridge terminal. I could not find any departing from Port Authority from a quick look around. Not the answer you're looking for? Browse other questions tagged tickets buses new-york-city or ask your own question. Travel from New York Port authority to Brookhaven National lab via bus( or any cheap method)? What is the cheapest way to get from Penn Station New York to Penn Station New Jersey apart from walking/biking? Cost and convenience of baggage storage at Port Authority NYC?